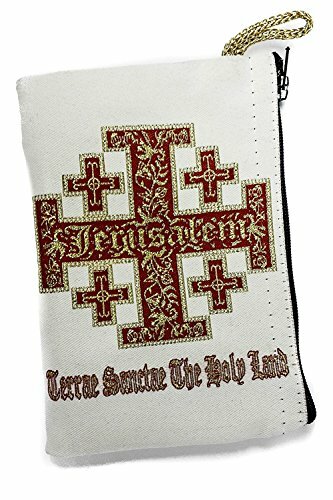 Icon Case Pouch Coin Purses Tapestry Prayer With Jerusalem Cross 5.7"
This beautiful tapestry pouch is pictured Jerusalem Cross on both sides . This icon pouch, lined with a zipper for closing, is perfect as a rosary or prayer rope case. This beautiful tapestry pouch is pictured Jerusalem Cross on both sides. This icon pouch, lined with a zipper for closing, is perfect as a rosary or prayer rope case. Product Measurement: (H x W) 9.6 cm x 14 cm / 3.8" x 5.7"
Icon Case Pouch Coin Purses Tapestry Prayer With Messianic Star Of David 5.7"
Icon Case Pouch Coin Purses Tapestry Prayer With Holy Family 5.7"
Icon Case Pouch Coin Purses Tapestry Prayer With Annunciation of Virgin Mary 5.7"
Icon Case Pouch Coin Purses Tapestry Prayer With Israel Map 5.7"
Icon Case Pouch Coin Purses Tapestry Prayer With Saint ST Charbel Makhluf 5.7"